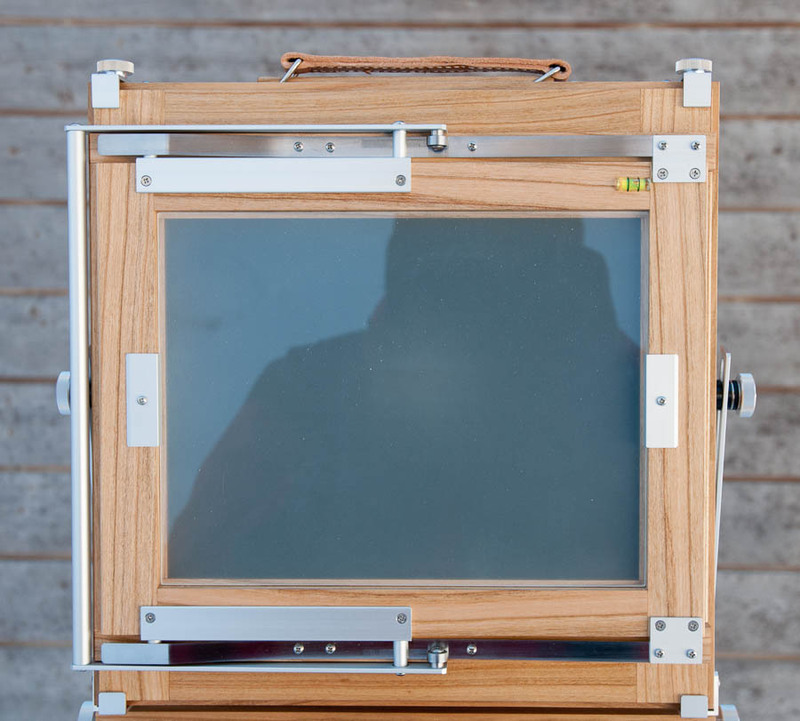 Having worked with a 4 x 5" camera for more than 30 years, I finally decided to move up to a bigger format. After countless hours on the Internet, and a long process of thinking and considering, I settled for a wholeplate (6½ x 8½") camera. 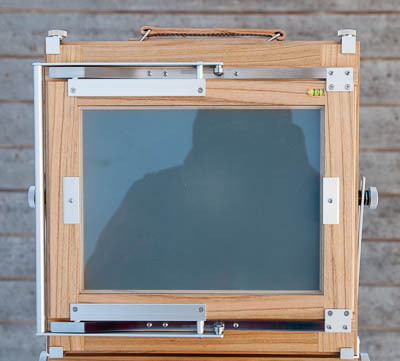 I also considered 8 x 10, but WP is a little smaller (film area three times bigger than 4 x 5, whereas 8 x 10 is four times bigger), which means a smaller camera that still takes pretty big negatives, and even more important, the possibility of avoiding lenses in #3 shutters, which is a real weight saver. The wholeplate format has had a revival in recent years, and there are at present (as far as I know) three manufacturers who make WP cameras: Ebony in Japan, Chamonix in China, and Argentum in Hungary. 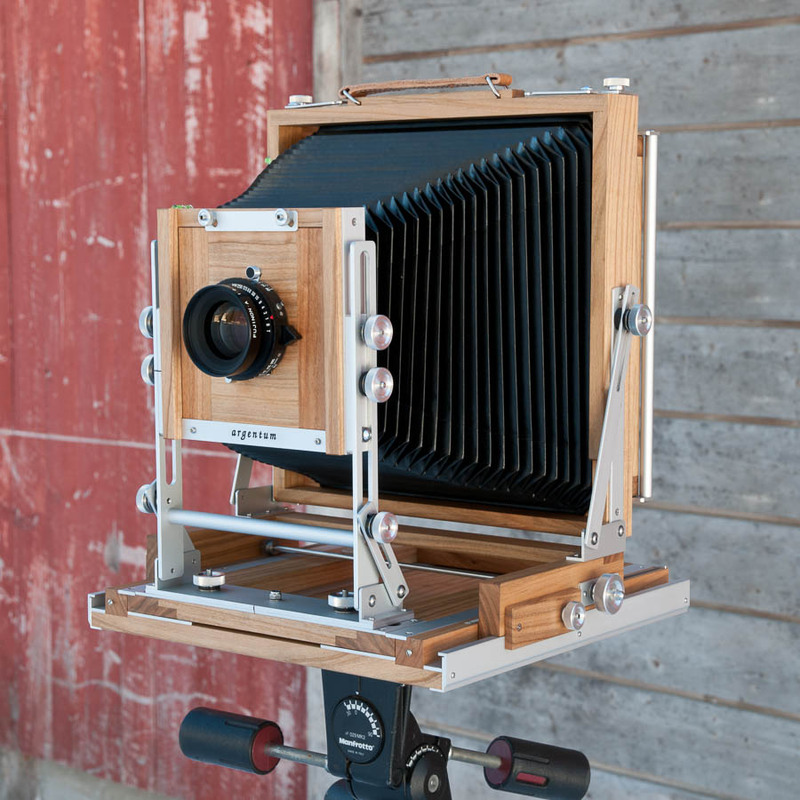 Ebony are known to make very fine cameras, but they are out of my price range. Chamonix make a very lightweight WP camera, but it has one feature that I strongly dislike - combined knobs for front rise and tilt. 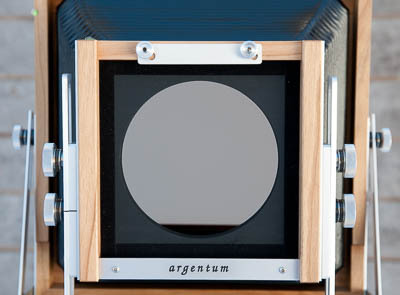 I had for some time been aware of Argentum cameras, and thought they looked very beautiful, but they did not seem to have a front shift, which is a must have for me. As I examined their website closer, it turned out that the Argentum Explorator comes in three flavors - Explorator I, which is very basic, Explorator II, which is compleletly customizeable, and Explorator III, which has a full set of movements. And I got a confirmation by email that I could indeed have a front shift - I could have any movement, or lack of movement that I liked. At this point I was getting so interested that I decided to go to Hungary to see a real camera, which I did in April 2010. Argentum is a one man business - run by István Soltész, who lives in the city Nyíregyháza in eastern Hungary, not far from the Ukrainian border. 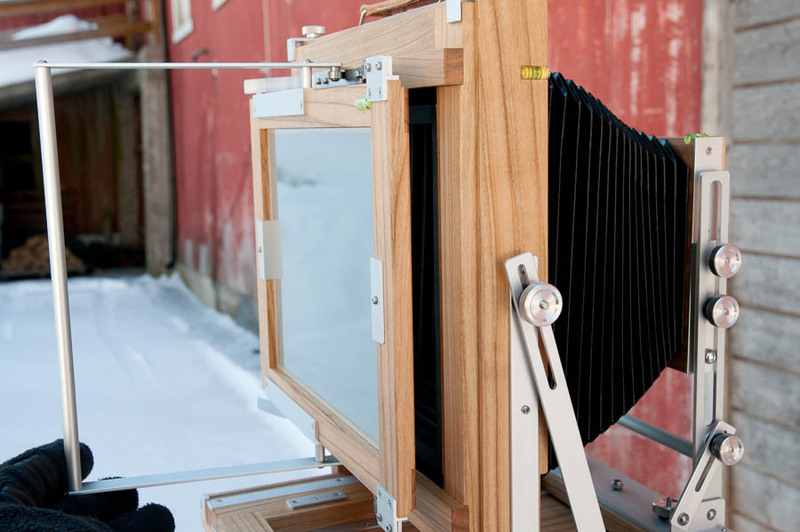 István is an engineer, photographer and teacher, who started to build view cameras in 1996 (his first camera was 40 x 40 cm - 16 x 16") because of his own needs. He does all the woodwork, metal work, makes the bellows, and even the groundglass - just about everything. He also makes only one camera at a time, and I was lucky that he had one finished camera when I came to see him - a wholeplate camera in black walnut. I am not so fond of black walnut, so I ordered my camera in cherry, which had been the only choice of wood up to then. I also ordered the traditional aluminum knobs instead of the black plastic knobs that István now prefers. I find the combination of cherry wood and anodized aluminum very beautiful. I added a front shift to the movements, but omitted front and rear swings, since I never use them. I never take vertical pictures either, so I could have had the camera with a fixed horizontal back, which would have reduced size, weight, and probably even price. But I thought this would a bit drastic, for all I know I might want to do some verticals in the future. There was also a choice of film holders to consider. 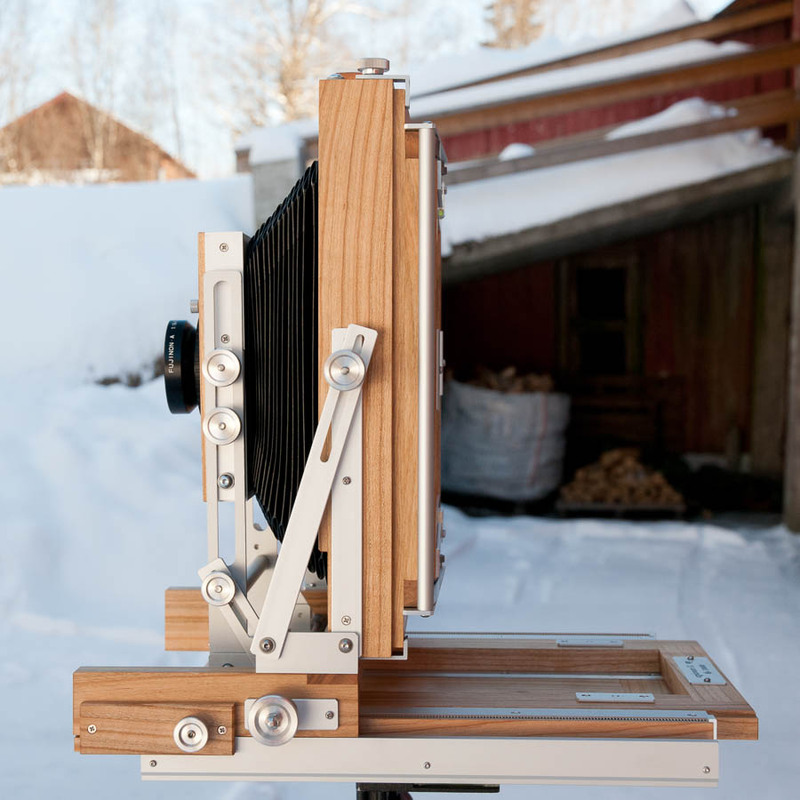 István makes his own wholeplate holders, which are thicker and heavier than the Chamonix holders, and also more expensive. And I believe they do not comply with the international standard for these holders. I am sure they are as high in quality as anything else István makes, but I didn't really want the extra weight and expense. István must have read my thoughts, because he himself suggested I get Chamonix holders,	maybe	because	he knew that making 10 holders would take a very long time. (everything is made to order) So I bought 10 holders from Chamonix, and sent one to István, so that he could make the back accurately. I have been very pleased with them. I placed my order for the camera in May, and recived it in November. 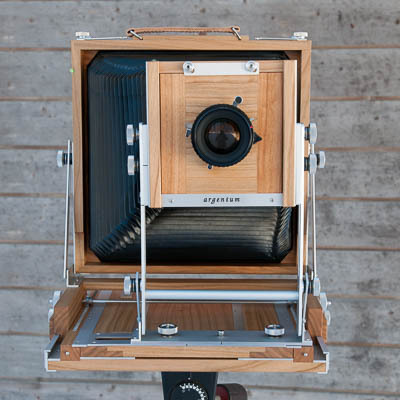 I paid 1975 Euros for camera, five lensboards, a spare ground glass, and a wooden box for the camera. Shipping to Norway was 54 Euros. 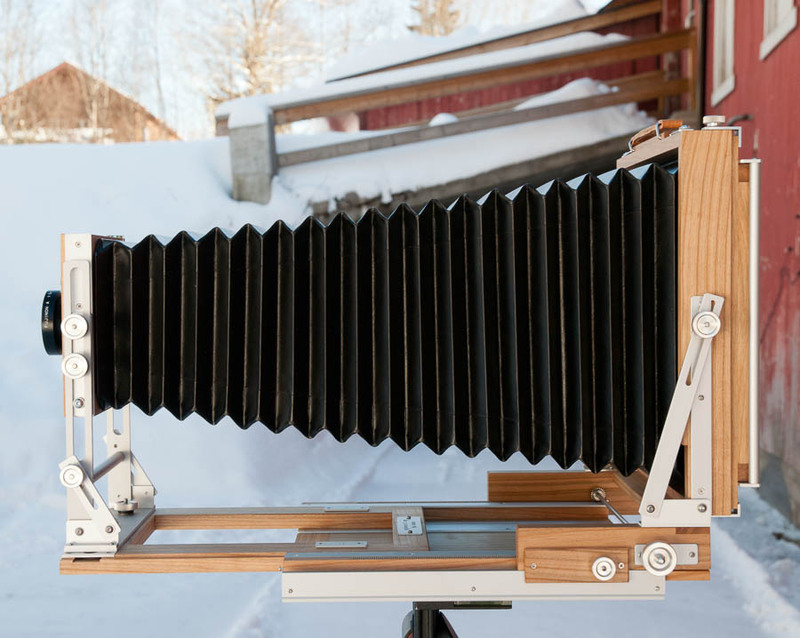 The camera is extremely well built, and woodwork as well as metal work is exquisite. The finish is superb, and all movements are smooth, and have very little play. Most of the knobs require relatively little force for tightening, this is due to tiny roller bearings between washers under the knobs. At first I found it hard to believe that this could work, but as far a I can tell,it does. I find the camera to be quite rigid, actually more rigid than I thought it would be. I was a bit sceptical to the narrow angle between the back and the supporting struts, but it does not seem to be a problem. The focus locks are in front of the struts, and when locked, the back beomes more rigid. As for the front - also relatively rigid, but obviously not as rigid as the back. The camera has three 3/8" tripod mounts in a row, the distance between the first and the third is 74 mm, I think there are some heads with two tripod screws that will fit this. Setting the camera up is fairly straightforward. The thing to remember is to move the back standard all the way back before lifting the front, to prevent the front struts from chafing the bellows. Front and back struts have detents for the vertical position, but only on one of the struts. I think setting up would have been easier if both struts had detents. The lensboards are very solid, and flat on the back. They have a felt lining along the edges that correspond wit a felt lining on the front standard. One of my lenses is a Schneider Apo-Symmar L 210 mm, and because of its construction, I could not mount it properly on a standard lensboard. 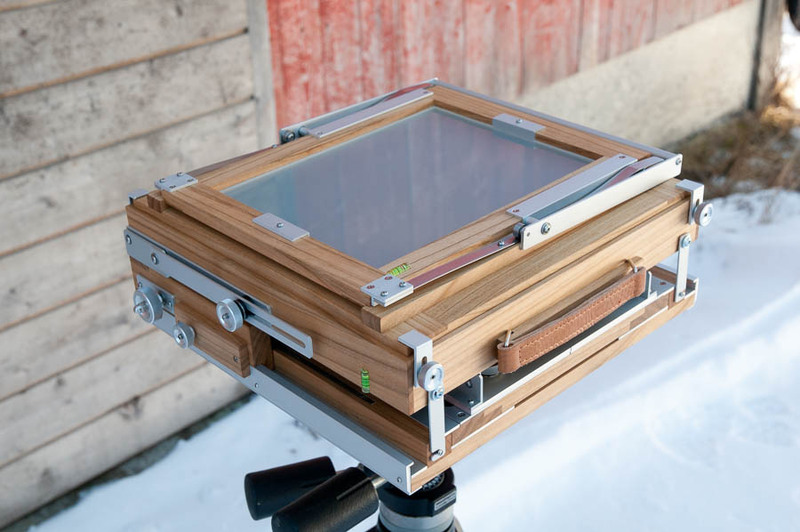 István solved this by making a lensboard combining wood and 2 mm aluminum. One of my favorite features on this camera is the way the lensboard is secured to the camera, by tightening two knobs. Once these are properly tightened, there is no worrying about the lens falling out. This is much better than the normal field camera design, where the sliding metal plate has pre-tightened screws, and you're never sure if they're tight enough. 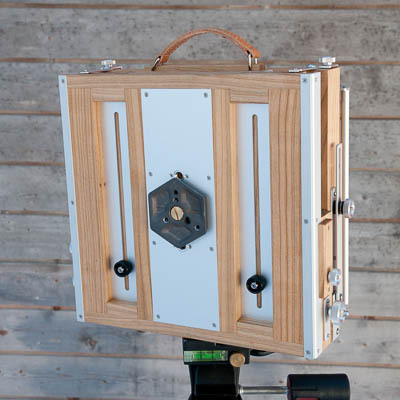 The camera has three spirit levels - one on the camera back above the ground glass, one on the side of the back standard, an one on top of the front standard. Unfortunately, none of them are accurate, but at least they are consistent - although not with each other. The level above the ground glass was custom made - normally there is no level here, instead there is a circular level on the camera bed, which I did not want - I don't think it would be very useful. Having set up the camera, it can now be used with lenses from 120 to 300 mm without moving the front extension. Focusing is done with the back, and locking the focusing is done with two knobs (one either side) that press a small piece of wood against a metal rail. These brakes can be set at anything from very slight friction to complete lockdown. 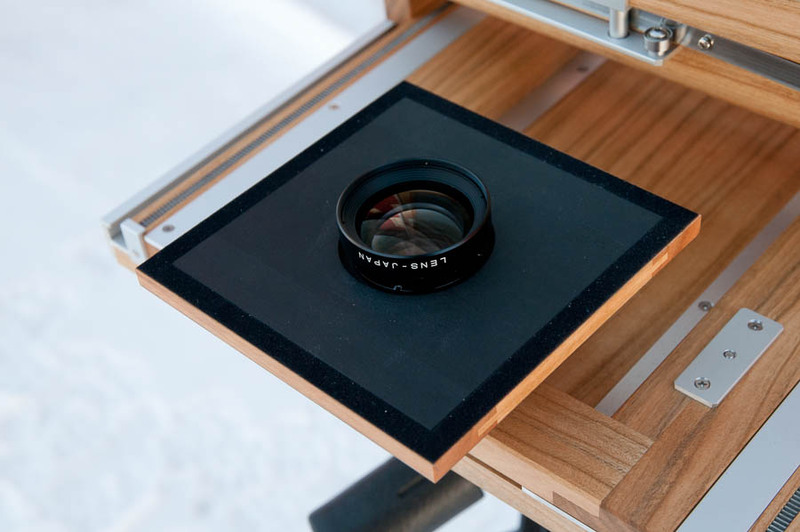 This comes very handy, because the focusing moves so lightly (at room temperature) that just touching the back with the focusing cloth will most likely move it. For lenses longer than 300 mm (and for closeups with a 300) the front can be extended 170 mm to a maximum bellows extension of 510 mm. Two knobs under the camera lock the extension. 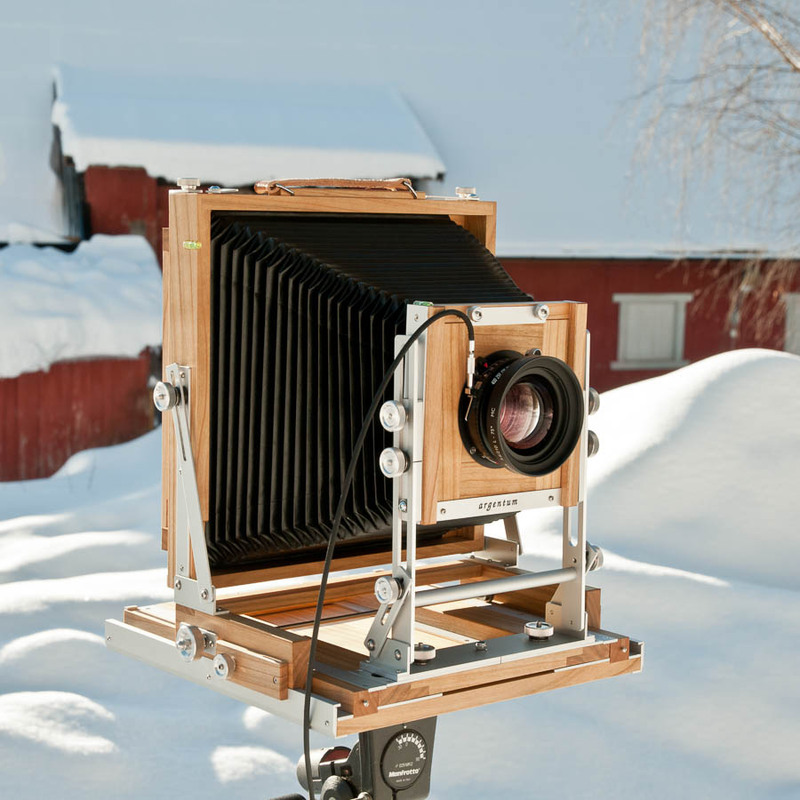 The bellows, which are fixed, get very stiff with short focal lenghts, and even more so in cold weather. I have an old type 180 mm Fujinon, which is probably the shortest lens I can use with movements. 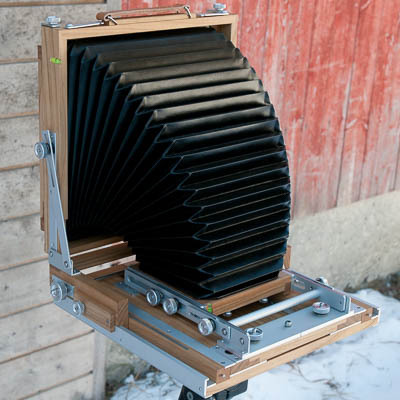 With a 150 mm Super-Symmar XL the bellows would hardly allow for any movements at all. (and this lens has a 386 mm image circle) The longest lens I'm likely to use is a 300 mm, so I should have ordered the camera with shorter bellows. I have for some time been using a 150 mm Super-Symmar XL with the camera, and I can get about 30 mm front rise with this lens. But the lens has a tendency to tilt by itself when the rise is applied, so care must be taken. The controls for rise/fall and axis tilt are separate, the tilt knobs uppermost. 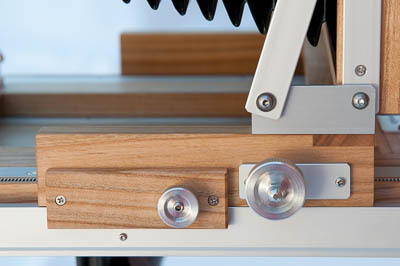 With the tilt knobs tightened, it is still possible to tilt the front, with some friction. This is a nice feature, because it makes fine tuning a tilt much easier. Another nice feature is the back's bail, which makes inserting and removing filmholders a breeze. The back can be removed and turned to the vertical position by unscrewing the two knobs on top of the camera. Since I only take horizontals, I keep them well tightened. The ground glass has no fresnel lens, but is relatively bright. At least that's my impression, after many years of working with an Arca with a fresnel lens. 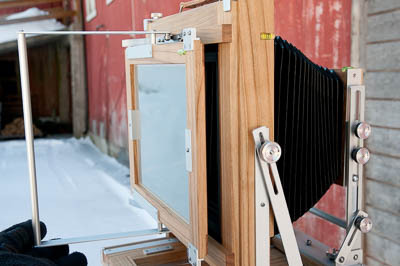 And the image on the ground glass seems to be excactly what you get on the film. The corners are not cut, which means I can see the whole image, not having to guess what's in the corners. And when I check the corners for coverage, I always preferred to look through the lens anyway, rather than from the back. Please note that using pictures from this site without my permission is breach of copyright.